Family Health Publications, 9781930448728, 288pp. 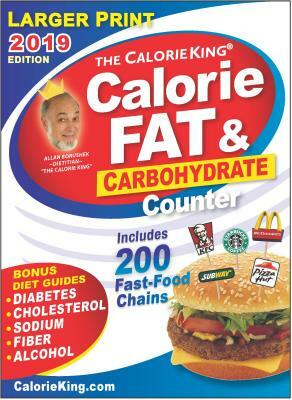 The CalorieKing Calorie, Fat & Carbohydrate Counter 2019--a simple, safe, practical and effective guide to a healthy and lasting weight loss. · Updated editions have outsold every book in category in all markets for more than 13 years. First edition was published in 1984. Whether you want to lose weight, keep track of carbohydrates to help manage your diabetes, reduce other diet-related health risks, or just want to make healthier eating choices, the CalorieKing Calorie, Fat and Carbohydrate 2018 is your best choice. It is a national best-seller, and favorite among both consumers and health care professionals. Start making healthier choices today with the CalorieKing convenient and reliable guide. Take it everywhere; look up foods before you eat, when eating choices count the most! The CalorieKing Counter makes it easy to know which foods to avoid. Better yet, provides options to help you make healthier choices to accomplish your weight and health goals. 17,000 food listings, both brand name and generic - researched meticulously and regularly updated by the CalorieKing team of dietitians and food researchers. Several informative reference sections on weight management, plus a section on diabetes co-authored with the world-renowned Joslin Diabetes Center. Color-coded nutrient listings to make it quick and easy to find your favorite foods.